The use of anti-personnel landmines is widely frowned upon, especially near populated areas. Article 4 of the Galactic Landmines Protocol prohibits the use of landmines (and similar cluster munitions) in "any settlement, outpost, port or other area with a similar concentration of civilians"... except where there is active/imminent ground combat. Another exception, which further vitiates the ban, permits landmine use near civilian populations if they are are placed "in close vicinity of a military asset... which is controlled or threatened by the enemy". Obviously, some governments exploit this peculiar drafting to justify the use of landmines. One such "government" is the Brotherhood of HIP 17706. This criminal organization has long hidden "in plain sight". The deceptively named "Smith Silo" is not a weapons silo, or any kind of military asset. In actuality, the Silo is filled with people (many captive) who need our assistance. Yesterday, "Strike Force Smith" reached the HIP 17706 system. This SINC flotilla has orders to limit collateral damage, and is currently engaged near HIP 17706 3 (safely removed from Smith Silo, or any other civilian population). 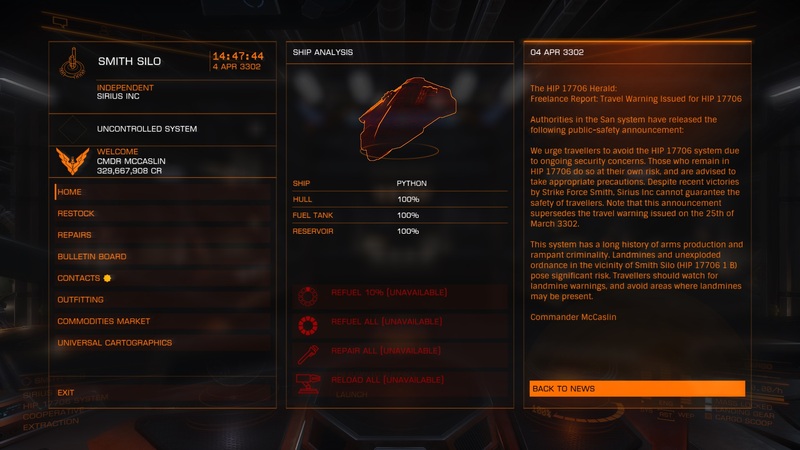 We urge travelers to avoid the HIP 17606 system due to ongoing security concerns. Those who remain in HIP 17706 do do at their own risk, and are advised to take appropriate precautions. Despite recent victories by Strike Force Smith, Sirius Inc cannot guarantee the safety of travelers. Note that this announcement supersedes the travel warning issued on the 25th of March 3302. This system has a long history of arms production and rampant criminality. Landmines and unexploded ordnance in the vicinity of Smith Silo (HIP 17706) pose significant risk. Travelers should watch for landmine warnings, and avoid areas where landmines are present. Smith Silo is under siege! HIP 17706 Allied strongly object to our presence in their "motherland", and demand the complete & unconditional withdrawal of Strike Force Smith. The San Bureau of Foreign Affairs (SBFA) has established a mission at Smith Silo, but no ambassadors have been officially recognized. According to Sirius diplomatic protocol, ambassadors may not represent their governments before a host government's foreign ministry until their credentials have been formally presented (in person) and accepted by the host government's chief of state. CEO Ollobrains has not met with the Allied "Peace Delegation", and is unlikely to do so for at least 3 Solar weeks. HIP 17706 Allied refuse to be patient, however. Shots have already been fired; Strike Force Smith is engaged. UPDATE: The ill-advised, poorly coordinated attack on Strike Force Smith has been defeated! HIP 17706 Allied surrendered this morning, after Oltion Station fell to a SINC counter-offensive. I'm told that agents of San Intelligence Network (SIN) played a key role, but details of the operation are classified. At any rate, HIP 17706 Allied ships have withdrawn to their remaining outpost (Swanwick Platform). Our peace treaty will hold for several weeks, but I doubt that HIP 17706 Allied will fully relinquish their claims.